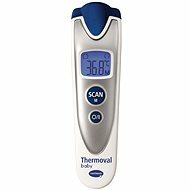 The JOYCARE JC-138G is a non-contact digital thermometer for the fast and precise measurement of body and room temperature. Due to its zero contact design, temperatures can be measured without the need to touch the skin—this ensures a high level of hygiene and guarantees that your baby will not become distressed. 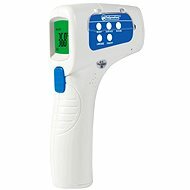 It is equipped to store up to 9 previous readings, making it especially suitable for children since it is possible to monitor temperature change. It takes approximately 3-4 seconds to obtain a measurement. Once complete, a prompt will appear to alert you immediately. The accuracy of the measurement is commendable, with a minimum of 0.2% deviation providing great comfort. The JOYCARE JC-138G features an easy to read, backlit LCD display. A great additional feature is the JOYCARE’s ability to measure room temperatures between 10 and 40°C. You will be able to record measurements alongside the time. 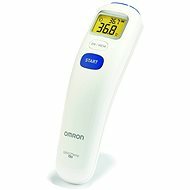 The thermometer also has an auto-off function, extending the battery life and periods of use. For shipping to other EU countries visit this page JOYCARE JC-138G. Für Versand nach Deutschland, besuchen Sie bitte JOYCARE JC-138g. Chcete doručit zboží do Česka? Prohlédněte si JOYCARE JC-138G. Chcete doručiť tovar na Slovensko? Prezrite si JOYCARE JC-138G. Für Versand nach Österreich, besuchen Sie bitte JOYCARE JC-138g. Magyarországra történő kiszállításért tekintse meg ezt a termékoldalt: JOYCARE JC-138G.